The shining jewel in the crown of the prestigious Madinat Jumeirah The Arabian Resort - Mina A' Salam is a grand boutique hotel in Dubai of exquisite style. A beautifully authentic expression of Traditional Arabian architecture, Mina A' Salam is a low rise building set amidst intricately landscaped gardens and an exotically beautiful beach side lagoon. Known for its unique and traditional Arabian hospitality, Mina A' Salam promises a comfortable and enjoyable stay for you on your Dubai tour. Mina A' Salam Hotel Dubai boast a total of 292 elegantly furnished guest rooms including 12 suites. All rooms and suites have their own private balconies, offering enchanting views of the Jumeirah beach and the Arabian Sea. The spacious and richly furnished guestrooms of Mina A' Salam Hotel are appointed with handcrafted furniture, natural materials and finest fabrics in Arabian themes. All rooms and suites are equipped with modern amenities such as spacious and modern bathrooms with shower facility, Satellite TV, Direct Dial telephones, Tea/ Coffee maker, Internet access, Room Safe to name a few. 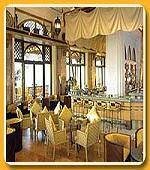 Mina A' Salam Hotel Dubai also has 5 well-maintained restaurants and bars, offering alfresco dining. All restaurant and bars have extensive terraces, which overlook the harbor and adjacent beach. Guests of Mina A' Salam Hotel can enjoy a wide variety of cuisine ranging from Sea foods to Chinese to International. The bars including Poolside Bar offer innovative cocktails and snacks. In addition guests of the Mina A' Salam can choose to dine any of the restaurants of Madinat Jumeirah, The Arabian Resort. Madinat Jumeirah, The Arabian Resort of Dubai offers a virtually limitless choice of over 45 world-class restaurants, bars and lounges. cMina A' Salam offers world-class banqueting and conference facilities to its valued guests. The hotel has two ballrooms - the main ballroom, Majlis Al Salam and a junior ballroom, Majlis Al Mina. In addition corporate guests can enjoy all the meeting and conference facilities available at Madinat Jumeirah- the Arabian Resort. Madinat Jumeirah offers world-class facilities for organizing conferences and banqueting or any event of any size. The Resort boasts a large 'Joharah Ballroom' with a capacity to accommodate up to 1,870 persons, the Madinat Arena (Multi purpose venue for up to 4550 people) and the 1000 seated outdoor 'Souk Amphitheatre'. All the meeting and conference rooms are equipped with the very latest and state-of-the-art Audio-Visual equipments. Other meeting and conference venues at the Resort include Fort Island (an outdoor function venue), Madinat Conference Hall with a seating capacity of 1,400 people and the Madinat Theatre- a 432-seat multi-functional venue. Mina A' Salam Hotel Mina A' Salam Dubai offers extensive fitness and recreation facilities to its valued guests. Madinat Jumeirah- the Arabian Resort has a 1 km long private beach with extensive water sports facilities, a world-class modern Spa 'Six Senses Spa' with 26 private treatment rooms, 4 large swimming pools, 3 squash courts, 5 floodlit tennis courts, 2 beach volleyball courts and a well-equipped Health Club the 'Quay Health Club'. Sindbad kid's club (4-12 years) is a hot favorite with children. Guests of the Mina A' Salam also enjoy complimentary access to Wild Wadi Water Park- a world famous water park- offering a variety of water sports. The facility of Golfing and Horse riding is also available on request. Other facilities available at Mina A' Salam hotel include a 24-hour Business Centre, Gift Shop, Shopping Arcade, Foreign Exchange Counter, Postal / Courier Service, Car Rental Service, Taxi & Limousine Service, Safe Deposit Box, Baby Sitting, Hair / Beauty Salon, Florist, Laundry & Valet Service, Parking Facilities, 24-hour Room Service and Express Check-in and Check-out Facilities to name a few.